UPDATE: I’ve added a comment to the end of the post about the use of 1990 as the start year. After an initial look at how the IPCC elected to show their model-data comparison of global surface temperatures in Chapter 1, we’ll look at the CMIP5 models a couple of different ways. And we’ll look at the usual misinformation coming from SkepticalScience. Keep in mind, the models look best when surface temperatures are presented on a global land-plus-sea surface temperature basis. On the other hand, climate models cannot simulate sea surface temperatures, in any way, shape or form, or the coupled ocean-atmosphere processes that drive their warming and cooling. Much of what’s presented in the IPCC’s Figure 1.4 is misdirection. 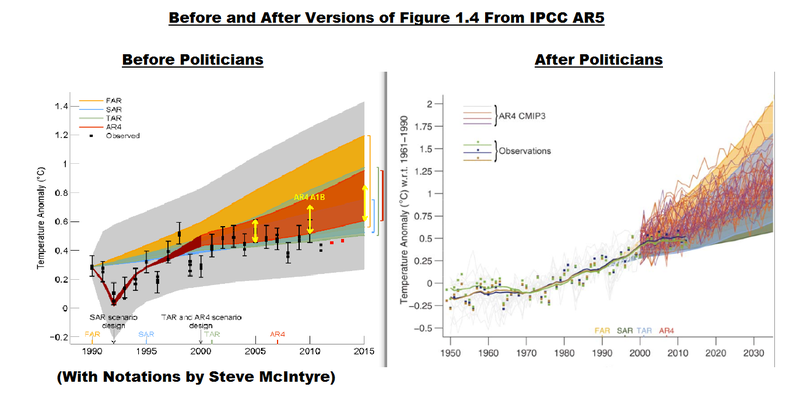 The models presented from the IPCC’s 1st, 2nd and 3rd Assessment Reports are considered obsolete, so the only imaginable reason the IPCC included them was to complicate the graph, redirecting the eye from the fact that the CMIP3/AR4 models performed poorly. Regardless, what it boils down to is the climate scientists who prepared the draft of the IPCC AR5 presented the model-data comparison with the models and data aligned at 1990 (left-hand cell), and that version showed the global surface temperature data below the model ranges in recent years. Then, after the politicians met in Stockholm, that graph is replaced by the one in the right-hand cell. There they used the base years of 1961-1990 for the models and data, and they presented AR4 model outputs instead of a range. With all of those changes, the revised graph shows the data within the range of the models…but way down at the bottom edge with all of the models that showed the least amount of warming. Regardless of how the model-data is presented, the models looked bad…they just look worse in the original version. While that revised IPCC presentation is how most people will envision model performance, Von Storch, et al. (2013) found that the two most recent generations of climate models (CMIP3/IPCC AR4 and CMIP5/IPCC AR5) could NOT explain the cessation of warming. Bottom line: If climate models can’t explain the hiatus in warming, they can’t be used to attribute the warming from 1975 to 1998/2000 to manmade greenhouse gases and their projections of future climate have no value. WHAT ABOUT THE CMIP5/IPCC AR5 MODELS? Based on von Storch et al. (2013) we would not expect the CMIP5 models to perform any better on a global basis. And they haven’t. See Figures 2 and 3. The graphs show the simulations of global surface temperatures. 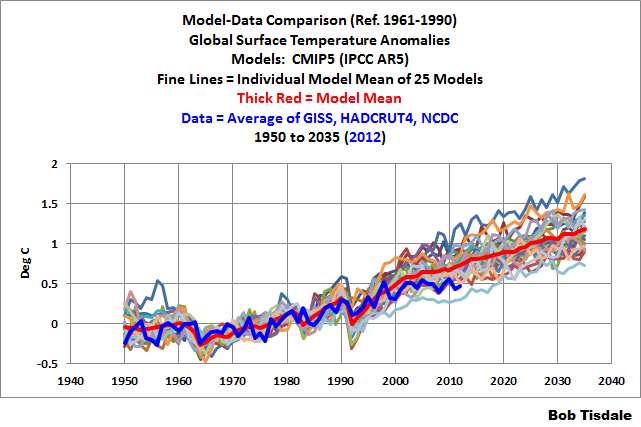 Included are the model mean for the 25 individual climate models stored in the CMIP5 archive, for the period of 1950 to 2035 (thin curves), and the mean of all of the models (thick red curve). Also illustrated is the average of GISS LOTI, HADCRUT4 and NCDC global land plus sea surface temperatures from 1950 to 2012 (blue curve). In Figure 2, the models and data are presented as annual anomalies with the base years of 1961-1990, and in Figure 3, the models and data were zeroed at 1990. 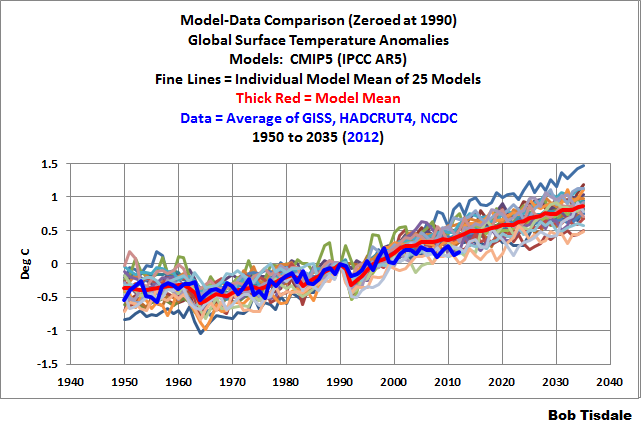 Note how the models look worse with the base years of 1961-1990 than when they’ve been zeroed at 1990. Curious. The data and model outputs are available through the KNMI Climate Explorer. NOTE: Every time I now look at a model-data comparison of global land plus sea surface temperatures, I’m reminded of the fact that the modelers had to double the observed rate of warming of sea surface temperatures over the past 31 years to get the modeled and observed land surface temperatures to align with one another. See my post Open Letter to the Honorable John Kerry U.S. Secretary of State. That’s an atrocious display of modeling skills. Global mean surface temperature data are plotted not in absolute temperatures, but rather as anomalies, which are the difference between each data point and some reference temperature. That reference temperature is determined by the ‘baseline’ period; for example, if we want to compare today’s temperatures to those during the mid to late 20th century, our baseline period might be 1961–1990. For global surface temperatures, the baseline is usually calculated over a 30-year period in order to accurately reflect any long-term trends rather than being biased by short-term noise. It appears that the draft version of Figure 1.4 did not use a 30-year baseline, but rather aligned the models and data to match at the year 1990. How do we know this is the case? Up to that date, 1990 was the hottest year on record, and remained the hottest on record until 1995. At the time, 1990 was an especially hot year. Consequently, if the models and data were properly baselined, the 1990 data point would be located toward the high end of the range of model simulations. In the draft IPCC figure, that wasn’t the case – the models and data matched exactly in 1990, suggesting that they were likely baselined using just a single year. Mistakes happen, especially in draft documents, and the IPCC report contributors subsequently corrected the error, now using 1961–1990 as the baseline. But Steve McIntyre just couldn’t seem to figure out why the data were shifted between the draft and draft final versions, even though Tamino had pointed out that the figure should be corrected 10 months prior. How did McIntyre explain the change? Dana’s powers of observation are obviously lacking. The projections are all scaled to give the same value for 1990. So Dana Nuccitelli didn’t need to speculate about it. 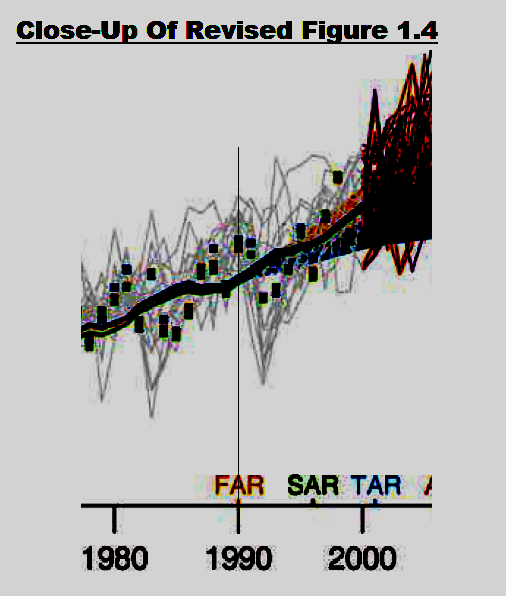 Second, Figure 4 is a close-up of view of the “corrected” version of the IPCC’s Figure 1.4, focusing on the models and data around 1990. I’ve added a fine line marking that year. And I’ve also altered the contrast and brightness of the image to bring out the model curves during that time. Contrary to the claims made by Nuccitelli, with the 1961-1990 base years, “the 1990 data point” WAS NOT “located toward the high end of the range of model simulations”. “Mistakes happen?” That has got to be the most ridiculous comment Dana Nuccitelli has made to date. There was no mistake in the preparation of the original version of Figure 1.4. The author of that graph took special steps to make the models align with the data at 1990, and they aligned very nicely, focusing right in at a pinpoint. And the IPCC stated in the text that the “projections are all scaled to give the same value for 1990.” There’s no mistake in that either. The only mistakes have been Dana Nuccitelli’s misrepresentation of reality. Nothing new there. At the time, 1990 was an especially hot year. Consequently, if the models and data were properly baselined, the 1990 data point would be located toward the high end of the range of model simulations. Dana appears to be parroting Tamino from Tamino’s blog post here. Oceanic NINO Index. Therefore, “1990 was…” NOT “…an especially hot year”. It was simply warmer than previous years because surface temperatures were warming then. I’m not sure why that’s so hard a concept for warmists to grasp. The only reason it might appear warm is that the 1991-94 data were noticeably impacted by the eruption of Mount Pinatubo. Tamino was simply playing games with data as Tamino likes to do, and Dana Nuccitelli bought it hook, line and sinker. Or Dana Nuccitelli hasn’t yet learned that repeating bogus statements doesn’t make them any less bogus. This entry was posted in IPCC SPM AR5. Bookmark the permalink. In addition to El Nino and La Nina events, the PDO is also impacted by the sea level pressure (and interrelated wind patterns) in the North Pacific, so there are differences between the PDO and ENSO. I interpret that quote to be based on statistical analysis of data (and not on a climate model). Climate models can’t simulate coupled ocean-atmosphere processes associated with ENSO or the PDO. Pingback: IPCC Adjusts Model-Predicted Near-Term Warming Downwards | Watts Up With That?